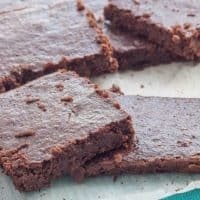 These healthy brownies are full of real ingredients and are a good-for-you spin-off of what I consider the best ever brownies. Brownies. I have an obsession, and I’m super particular about them. Whenever I’m invited to take dessert somewhere, I bring my brownies. You know, the ones I claim to be the Best Brownies Ever. Because they’re perfect, they’re fail-proof, and everyone just gobbles them up. The problem though is that everyone knows I run a healthy blog, so they get excited when they see me carrying brownies because they think they’re going to be both delicious AND healthy. Turns out, my best brownies ever don’t have many qualities that put them in the “health food” category. 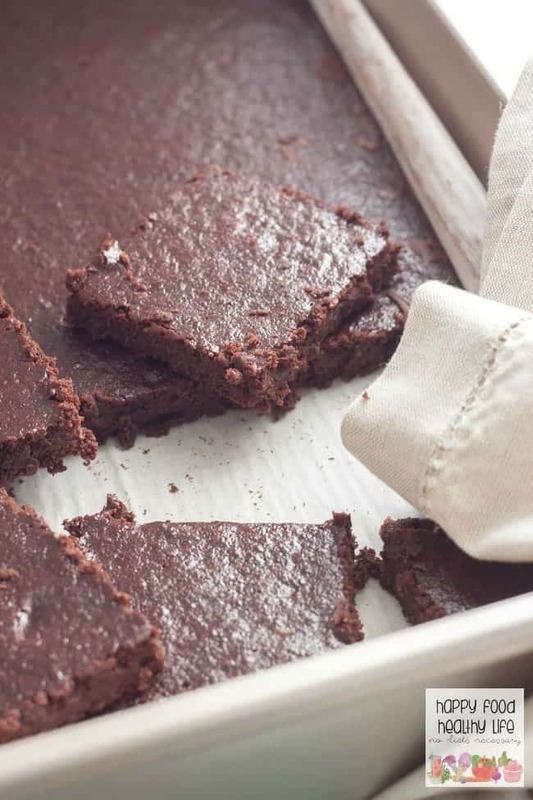 (read it here – it will probably change your life and allow you to eat more brownies). But after all these years of making desserts more health-conscious, I thought it was about time that I gave my best brownies ever a bit of a makeover. Butter could be applesauce. Both sugars could be coconut sugar. The eggs could be flax eggs. The flour could be whole wheat pastry flour. And of course, the chocolate could stand to be a little darker. Damn, I pretty much had an entirely new brownie recipe at this point, and I was both excited and scared. I had no clue if this would actually work out, but I desperately wanted it to. I was mostly scared when melting the applesauce with the chocolate. This was totally new and health-nut-status for me, and I thought it was a for-sure fail at that point. But I went along with it and hoped for the best. WIN!! Total win! It was delicious, and I was relieved. It was sweeter than I expected it to be. The applesauce totally worked, and the coconut sugar was wonderful as well. Ahh! Now, I just had to get it in my OXO cake pan and into the oven to see if it passed the next test… fudge factor. I like my brownies super soft and almost under-baked. Like a fugdey texture. The wait to find out the results seemed to take FOREVER. But once they were finally done, I took them out and was still a little scared. They didn’t have that awesome crust that my best ever brownies have, so I didn’t know what to expect. After they cooled for the next hour, I had to cut in and see. TOTALLY FUDGEY!! They’re actually a mix between cakey and fudgey, but I’ll totally take it. The taste it spot on. The texture is fantastic. And better than anything, there are no black beans or avocados in my brownies like other healthy brownie recipes I’ve seen. Nope, I couldn’t do that to you. You’re welcome, my friend. More than anything, I wanted this to be a special recipe. A recipe that everyone could enjoy, especially kids. And what kid doesn’t love a brownie!? Today, I’m working with one of my favorite companies, OXO, and we’re teaming up again this year for a good cause. We’re fighting against kids’ cancer – a fight that is worth every penny spent. No child should have to lose the battle to this horrible disease, and OXO is putting their best foot forward to help raise money for the cause. The great thing is that you can help too! 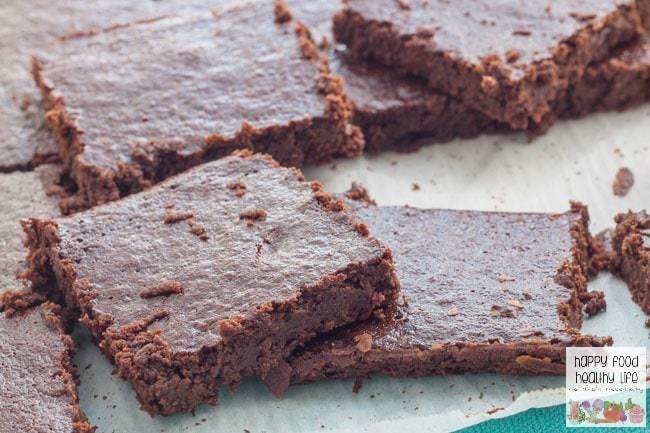 Just by baking a recipe like these brownies. 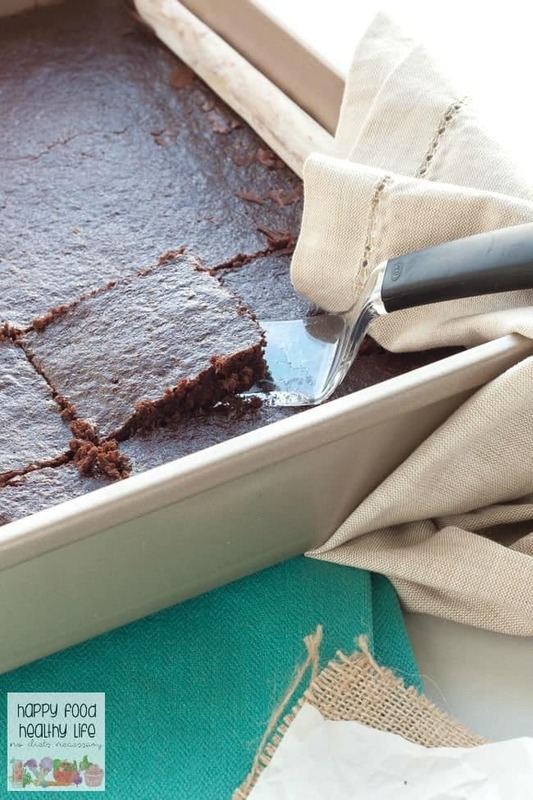 The cake pan I used was perfect for these brownies, as well as the brownie spatula and dusting wand to add the perfect touch of powdered sugar. When you buy specially labelled OXO kitchen tools with the label below, you help the cause. OXO will match donations and purchases up to $100,000 in 2015, which is absolutely amazing! This one simple gesture of buying your baking tools through OXO this holiday season could make such a huge impact in one child’s life, and that is one good baking choice I know I can get behind. 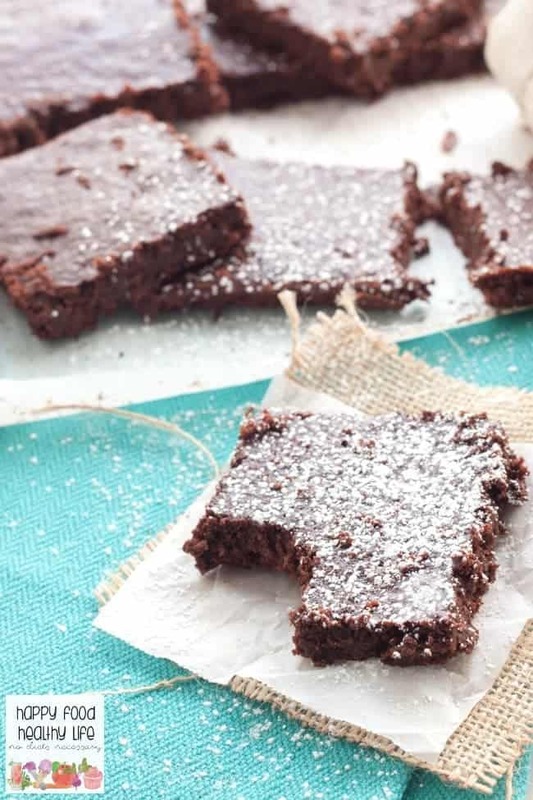 Want a healthy but fudgey brownie without weird ingredients? This is the one for you! Preheat oven to 325 degrees F. Coat 9x13 pan with foil and a nonstick spray for easy removal. Combine ground flax and water in small bowl. Stir to combine and set aside. After about 15 minutes, it should be gelatinous and gooey kind of like an egg. Melt chocolate chips and applesauce over low heat, stirring. 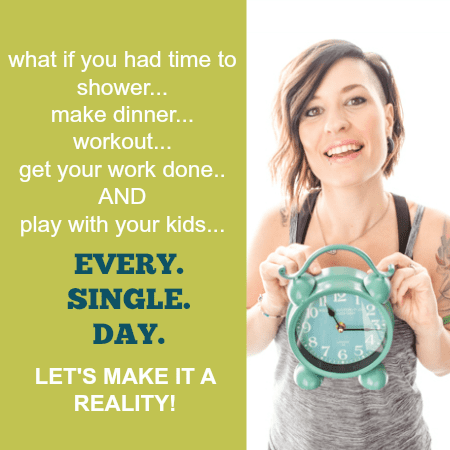 I usually set up a double boiler situation with a small amount of water boiling in a saucepan and a glass bowl on top of the pan (not touching the water) with the chocolate and applesauce in the bowl. Off the heat, whisk in coconut sugar, flax mixture (small amounts at a time), and vanilla. Add batter to prepared baking pan and bake in preheated oven for 45 minutes, until toothpick comes out clean. Let cool completely before cutting into bars. Could I sub the apple sauce with pumpkin puree since it’s pumpkin season? Hi Cynthia! I totally think pumpkin will work in this instance. Such a great idea. I haven’t tried it with pumpkin, but I don’t see why it wouldn’t work. Come back and let me know!